•High Power LED spot lights( can be dimmable ). 6W and 7W with MR16, GU10, E26, E27 Base. •Liquid cooled SL-50W stand lamp/garden lamp. *Our Liquid cooled SL-50W stand lamp has won the 3rd prize in National Taiwan Lighting Elite Competition and was awarded during the fair. In conclusion, we thanks for the lighting fair letting us meet with so many old partners and new guests, with constant quality improve and excellent service. 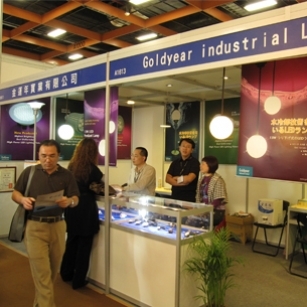 Goldyear has great confidence to be the best supplier for our customers. Anything I could do for you, please send me an e-mail. I will do my utmost to support you !